Read about long distance movers below to make your move stress-free. 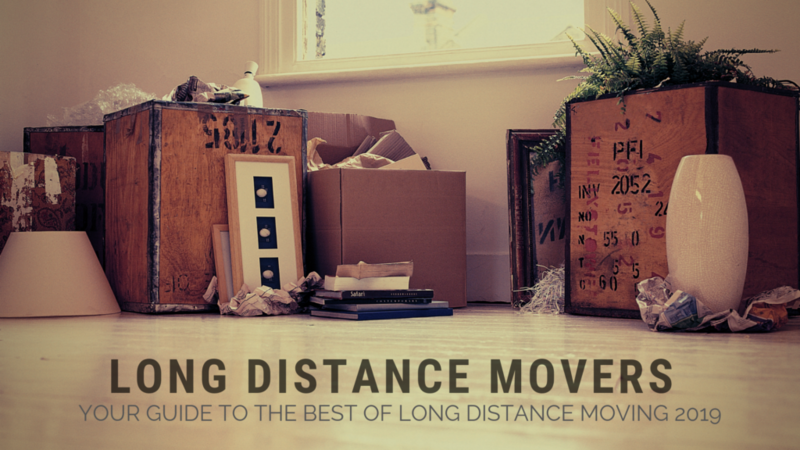 The best long distance movers didn’t get that way overnight – they have spent years fine-tuning their logistics, training their staff, and getting established by providing a stellar service. Crossing state lines requires an additional license, paperwork, and requirements. Your belongings also have further to travel, so the company must be certain that everything is well secured and stable for the haul. Don’t leave your move up to movers that have been in business less than 10 years. Usually a mover will start out as a local mover then by year 5-6 start doing long distance moves. By the tenth year, they should have fixed all of the mistakes along the way. This should be a no-brainer, but the best long distance moving companies should be able to quickly and easily provide proof of their licensure and insurance with zero runaround. Look up a mover’s license on the Federal Motor Carrier Safety Administration’s website, but you shouldn’t need to do that research yourself. Ideally, the company has their FMCSA license number displayed in plain sight and offers you a full explanation of their insurance coverage options. A verbal estimate holds no legal weight; so when comparing the costs associated with each long distance moving company, make sure you know that you’re comparing apples to apples. The best-rated long distance movers near me are clear and transparent about what your move will cost and provide a line by line breakdown of what they are quoting. If your movers want to just give you a number without emailing you what it includes – that is a major red flag. You can use this long distance moving calculator to find out what your long distance move should cost. Good service inspires good reviews, so look for long distance movers near you that has a good track record according to their customers. Keep in mind that no company can escape a bad review or two because we all know there are some people you cannot please. We suggest checking customer lobby for long distance moving company reviews. The reviews have to be verified. Most movers who determine that you’re moving a long distance will bill you based on weight rather than volume or time required to move you out and into your new home. If your move is based on weight, then you’ll need to ensure you throw out anything you don’t want – why pay for things that you really don’t want/need in your new home. 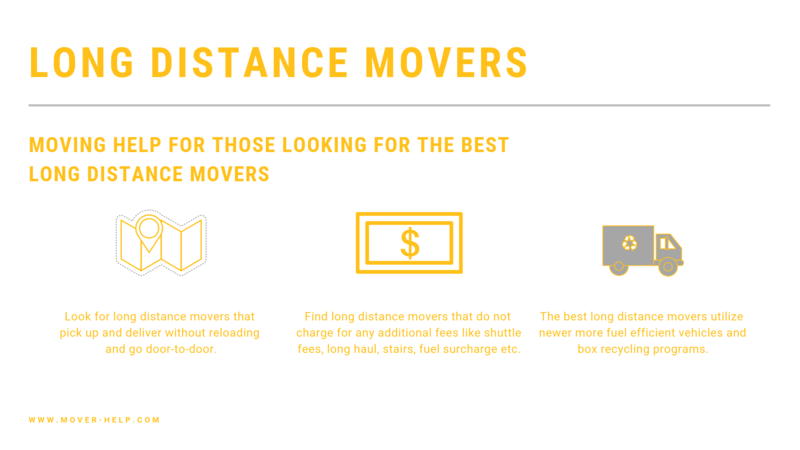 How do long distance movers estimate weight and costs of your long distance move. What is the average cost of long distance movers near me? Some movers may charge you based on the time required to conduct your move then add on a plethora of additional moving fees to cover mileage and fuel charges. While this is less common, you may find movers who suggest this type of estimate. Ask the mover to estimate the number of hours required and what the extra charges will be and make sure you get the estimate in writing before you hire. 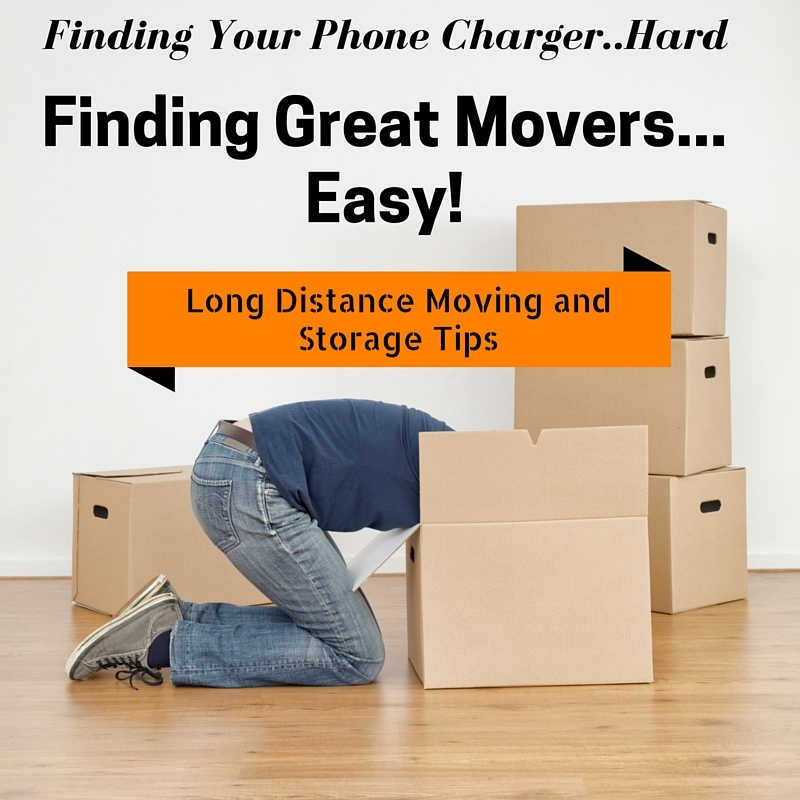 HINT: Go with a long distance mover that charges by weight, not time and distance. Just don’t – that is our best advice for anyone using a moving broker or a third party mover. The rates will increase 30% or more to pay for the middle man or worse the quality could decrease – either one will happen using this type of mover. Some long distance movers will use a third party mover to conduct part of the move as a representative of the larger moving company. This means that the truck that picks up your stuff might not be the same truck that delivers it. Ask the company before you hire. You should be told of any third party movers involved in your move so you can research the third party company in addition to the larger mover. Often the smaller mover is a local company that the moving company contracts with to deliver within a certain territory. The broker can switch the smaller mover at any time if they find a better deal so be careful! Why Monster Movers are the best long distance movers? • They pickup and deliver all long distance moves with a trained, professional crew of Monster Movers – no day labor here! They offer any moving service needed – from packing, unpacking, storage, and other moving services to customers and can assist with in-house moving, such as assembling beds and arranging furniture as desired at your new home. Monster Movers offers a full range of moving services across the nation and between our regional offices that includes property and household goods move management. Monster Movers absolutely does not brokerage moving services and does not swap or sell your move. 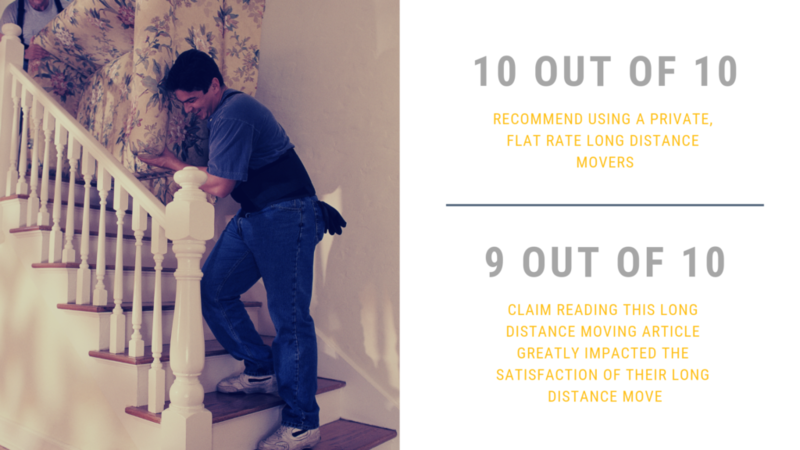 With more than 10 locations, each home to a full-time team of highly trained professional movers, they keep the travel time charges to a minimum. Long Distance Movers Near Me have offices all around the country and know the best routes with the least complications for your cross country move! 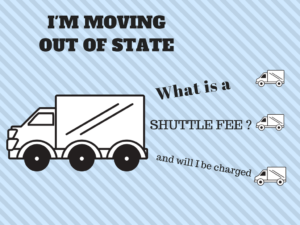 What is a Shuttle Fee and Will I Be Charged During my Out of State Move? Shuttle fees – one of the biggest moving scams in the world – can cost owners hundreds or even thousands of dollars. Most of the time shuttle fees are completely made up and unneeded and the most expensive of all of the “additional charges” moving companies and van lines can hit you with. What is a shuttle fee? At the pick-up address, the driver will park his truck as close to the pickup address somewhere nearby. A van line will hire a local origin agent to move the shipment with a smaller truck and a two man crew to help load the items out of the origin residence onto the smaller truck at an insane rate around $150/hour. The smaller truck will than transport the goods to the over the road van. The driver and his crew of the over the road van will than transfer the household goods from the smaller truck to the over the road van. Depending upon the size of the shipment, this process could take several trips with the small truck. At destination, the process is reversed if there is a need for a shuttle. Make no doubt about it, van lines want to charge shuttle fees because they make 20-30% off of each of these moves. This is an opportune time for an out of state moving company or van line to increase their fees for your move. These days there are private out of state movers that use smaller trucks for efficiency and you will never have to worry last minute that you will be charged a shuttle fee. Please note – even if you have a moving estimate, shuttle fees aren’t known until the driver actually arrives. Check your paperwork, shuttle fees are legal to charge anytime! Most movers have impractical operation (or shuttle) provisions in their tariff which allow them to legally apply additional equipment and manpower charges to your bill of lading. Most of the time, your driver will assess the situation but he can charge the shuttle fee at any given point. Even if the charges are not included on the original cost estimate. Your out of state mover cannot charge a customer for shuttle service if they didn’t use any other equipment or manpower to perform your move. Many smaller, walkable cities like Boston and NYC have laws preventing tractor trailers in many areas. In NYC, tractor trailers are not even allowed in Manhattan. Your best bet is to hire long distance movers that won’t charge these unnecessary fees. Were you one of the people that vowed to move to Canada if Trump was elected president? Well, it’s not your imagination – it really happened. 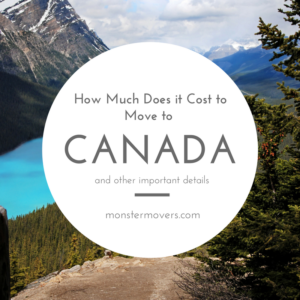 Now the real questions about finding movers and how much it actually costs to move to Canada. Another helpful article regarding long distance moving in general is our Not So Quick Long Distance Moving Tips which includes the pertinent questions to ask your US to Canada Movers. 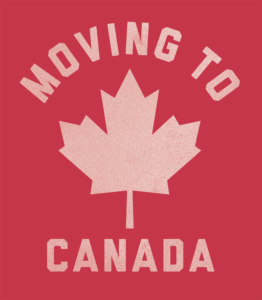 When researching long distance moving companies to move you to Canada – you need to make sure they don’t have any additional international fees on top of their rate per pound – this can increase your move by hundreds or even thousands of dollars. Some larger van lines charge interstate rates up to $.40 more per pound – so make sure all fees and costs are in writing! A good place to start is finding an online long distance moving estimate to get an idea of your shipment weight. Other Minor Details of moving to Canada will be outlined in the Canadian immigration website or http://www.cic.gc.ca/english/immigrate/index.asp . There is greater chance that your things will be missing/damaged when you need long distance moving and storage in the interim. Here is why – most movers buy/sell/transfer your move and there are so many hands that touch your shipment. Let me put it this way – it would be really hard to prove where your things ended up missing/damaged. What can you do to protect your items? Hire a long distance mover who doesn’t sell/trade/buy shipments. Also the best long distance movers will make sure the same crew that loaded your shipment delivers after storage. Do your research. 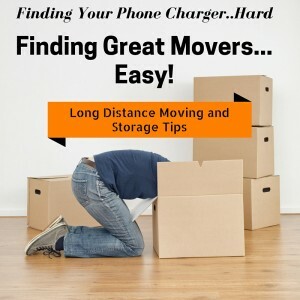 I really hate this cliche – like you don’t already know – check reviews blah blah blah… Here is the insight I can provide about long distance moving and storage research. You have to feel comfortable with them. A nice voice on the phone isn’t the only reason to book with your mover. And a FYI – BBB, Yelp, HomeAdvisor, Angie’s List are all PAID services. I suggest finding long distance moving company reviews that are from third -party, verified sites like customer lobby. Make sure you store your items in the state you are moving to. A lot of customers store items in their pick-up state they are moving from. This gives the customer absolutely no leverage if the first move stinks. Also, the price could change drastically – especially when using containerized storage. Hire long distance movers with flat rate long distance moving fees. Don’t use containerized storage for long distance moving and storage . First of all, per month storage fees are very high and the units are/can: easy to break into, fall apart, a nice home for insects/rodents, notorious for uncharges, billing issues, and in general horrible customer service. If you are using long distance moving and storage to move to a new climate say – from NY to FL – you should consider opting for humidity controlled storage unit or FL to NY – heated storage. This isn’t for everyone… if the most expensive piece of furniture you own is a desk from IKEA – any type of storage should do fine. Pro-rated storage for your long distance move can save you hundreds. Most van lines and larger moving operations will charge you for a full month of storage even if you move out on the 5th of the month. If you are moving long distance and need storage for six months or more – you will need to sign storage documents every six months and if you fail to – your coverage may be voided. This should be the responsibility of your move to remind you of but it’s always good to be aware. You can find the best long distance moving and storage operations along the east coast by doing a search for your local Monster Movers. It is common knowledge that moving from state to state can be taxing. When looking for an out of state mover, this simple advice can shave hours off of your search as well as keep some dollars in your pocket. Moving from Boston to Florida is a very popular for those moving from state to state. Therefore, you can expect to spend a little more money for your state to state relocation. On the flip side, if you are moving from Florida to Rhode Island – not as popular, and not as expensive per pound. 2. Long Distance Moving is least expensive during off peak times of the year. If you can plan your state to state move in say February or March, this will greatly reduce your moving fees by up to 20%! 3. Another kernel of advice is figure out if all of your furniture is “worth” the out of state moving fees. Sure, some items are sentimental and can’t be given a declared value per se. You can expect on average of $.50/lb for an interstate move. So, you have an ikea table that you have had for 3 years – scratched. At $.50/lb x the tables weight say 150lbs. That equates to $75. You have to decide if the table is actually worth $75. Thanks to various outlets like craigslist and the Salvation Army, donating furniture is easier and may be a better option than moving everything from state to state. 4. Packing for your state to state move is extremely important. Here are some state to state packing tips. Remember to ask you long distance mover if they provide complimentary materials to help you start packing. 5. Finding the best moving company for your state to state move starts with comparing movers. This is a quick link to a printable spreadsheet to compare movers for your state to state move. 6. Organizing your state to state move is incredibly important. A helpful tool is a moving state to state checklist to assist in the organization. Of course, everyone will have their specifics to add to this list but it is a great start. 1. If you hire a long distance moving company going by square foot, they may not load your shipment “high and tight” instead they can essentially load the shipment to take up more space if they need to fill a truck… I am sure you understand this concept. 2. It is really quite hard to estimate a shipment that is charged by square foot simply because of whoever is loading your shipment. Remember that Atari game from the 80’s called Tetris. Some people have a good eye for seeing empty spots and some don’t. When your shipment is priced by weight, it is an indisputable number. There is no confusion whether or not the people loading the truck did a good job or not. At this time there are only a handful of movers that can actually guarantee delivery dates. 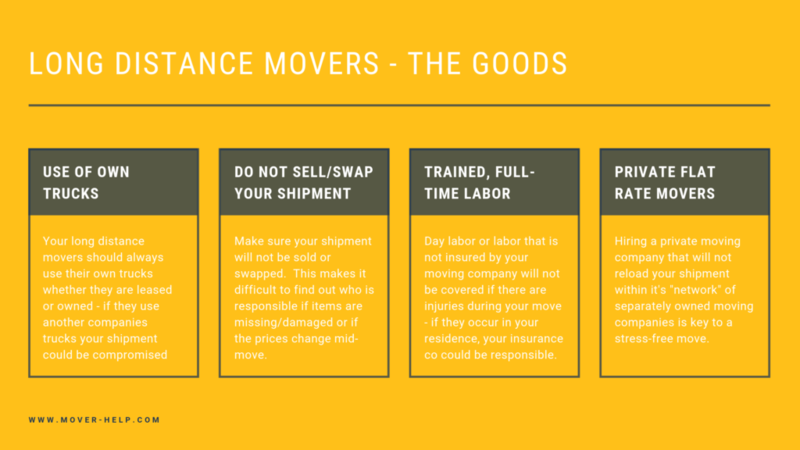 These are the best movers to use. This means they have great logistics and services. Find one of these movers near you. Long distance moving companies must cooperate with DOT regulations and laws regarding licensing and weigh stations.You see, when a moving company is traveling across state lines/past weigh stations, they have to make sure the truck isn’t overweight ( or there are huge fines enforced). Good long distance moving companies will have their licensing numbers clearly on the door of their truck. Their drivers also need health forms and log books at all times. I suggest making sure your long distance mover has full time labor and drivers that stay with the shipment. The last thing you want is a poor crew on the offload of your shipment in your new home. Make sure your mover has full time labor and experienced drivers. There are no moving companies that provide insurance. They only provide coverage which is bound by their insurance company. Please, make sure your mover is insured – ask them to provide proof of insurance. I love to support mom and pop businesses but, honestly – this is not the industry that I would suggest trusting anything anyone says over the phone. Ask for proof, ask for paperwork. If they want your business this should be easy to provide. Here’s how long distance moving company coverage works – every moving company, by law must cover good for $.60/lb/article. I always chuckle when movers add “basic coverage included” in their estimates – it’s required by law and movers cannot charge an additional fee for this basic coverage. Some, great movers offer full replacement value coverage. Choose a long distance mover who does. Even if you don’t opt for the full replacement which is always an additional fee – you know they have quality movers that will do a great job. The additional fee for full replacement coverage for long distance moves is based on weight. Some moving companies charge an exorbitant amount for full replacement coverage. Also, some have a deductible. Get all of these fees in writing. Some movers make you choose this coverage before the move. I kind of steer clear of movers who do this unless you plan on taking the coverage. It’s kind of like saying okay – if you pay extra, we’ll send you a good crew. I would suggest movers that let you choose on the day of the move.